The fine craft of brewing beer today is at its core simply a natural biological process produced by the fermentation of cereals with the help of the living organism yeast. 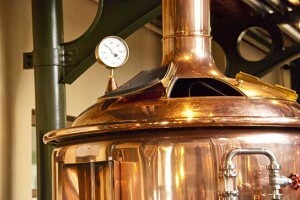 There are four essential ingredients needed for brewing beer – malt, hops, yeast and water. Each impact the color, aroma and taste of beer to varying degrees. After being harvested, barley is turned into malt by being given just the right amount of moisture and warmth for its kernels to geminate. The malted barley is then dried – and for some brews roasted. The wort is then run into a giant copper kettle to be brewed with hops that are added at various times during the process to impact different levels of bitterness flavor and aroma. Once the hops are strained off the wort, it is pumped to cooling tanks and poured over refrigerated coils. The cooled wort is then sent to a “fermenter” where yeast is added. After the yeast has done it’s proper amount of work, it is removed from the brew and the beer is pumped into aging tanks. Once aged, the brew is given a final filtering and a bit of carbonation. Finally the beer is packaged and sent on its merry way to be drunk. Made from grain, malt is to beer what grapes are to wine. It is often referred to as the “soul of the beer.” Barley is the most commonly used grain for malting – steeped in water until it partially germinates and is then dried in a kiln. The more intensely kilned malt, the darker the beer. Depending on the style of the beer being brewed the brewer may use just one type of malt or as many as seven. The hop is a climbing plant like a vine. Often referred to as the “spice of the beer” the hop cones are the only bit of the hop plant used in brewing. In fact, only the female hop flower is used, as it produces tannins that help clarify and preserve the beer. In addition, it has the resins and essential oils that are the principal sources of a brew’s aroma and dryness. A variety of hops can be used in beer with each hop having a distinct flavor, bitterness and aroma. Hops help to preserve beer, act as filtering medium in the brewing process and improve the foam-holding capacity of the beer. Yeast is the microorganism that feeds on the sugars in the malt to produce the alcohol and carbon dioxide of the beer. It is often referred to as the “lifeline of the brewery” with each brewery’s unique yeast strain being secretively guarded from competitors. There are two main yeast types used in brewing – Ale yeast and Lager yeast. Beer is compromised of 90 percent water with its harness and mineral content determining the character and style of the beer brewed. Softer water is typically used in Pilsners while harder water is most commonly used in brewing Ales. The taste and experience of enjoying fine beer is not only affected by the brewing process and ingredients but also by the way the beer is presented, poured and consumed. Like any dining experience, the proper setting and preparation can mean the difference between an ordinary experience and a fabulous one. Here are a few things to consider when serving beer. Taste from less to more intense. If you are trying a variety of brews start from the lightest flavor and move to the richest. Alcohol, hops, roast malt and sweetness can tire your palate, so it’s wise to put the more delicate beers at the start of the tasting. Glassware matters. Proper glassware shows off the color, supports the head, and focuses the aroma of beer for the best possible tasting experience. All classic European beer styles have a traditional glass and American versions usually work well in those. Whatever the glass, make sure it is spotlessly clean. Stronger beers should be served in smaller portions. Consider getting a selection of pint, stein, tulip and pilsner flute glasses. Control the setting. There are many different types of tasting experiences, from formal judging to casual drinking. In all instances, providing a comfortable environment free from distractions will enhance the experience and show off the beers at their best. Light, noise, smoke, room temperature and many other things need to be considered. Don’t overdo it. Whether at a beer tasting or a dinner, tasting too many beers can lead to palate overload. Try to limit the number of beers to 6 to 8 tasting portions. Beer contains alcohol, so please enjoy responsibly. 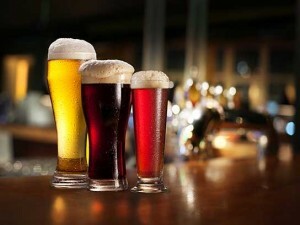 All beer styles fall under one of the two main beer types that of an Ale or a Lager. This list only touches the surface of the extensive varieties, starting with broader styles and descriptions and then dipping into details for some very specific brews. 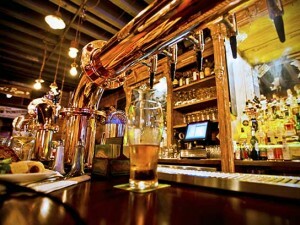 Ale is the older and broader of the two main categories of beer. Stouts, Porters and Wheat beers are all types of Ales. Ales are fermented with top-fermenting yeast, usually near room temperature and tend to have a fruitier complex flavor. Darker in color than Lagers, ales mature (age) from a few days to a few weeks. Stout is a full-bodied and flavorful beer with a hint of carbonation. It generally has a thick dark, rich color with a dense white creamy head and a flavor similar to coffee. Porter is similar to Stout being full-bodied with a hint of carbonation, yet it is lighter than Stouts with it’s chocolate color and carries a variety of tastes including sweet, bitter, milk and even oatmeal flavors. India Pale Ale (IPA) is a hoppy, pale, golden Ale typically having citrusy and floral aromas. Hop flavor is inevitably quite high and bitterness quite assertive. In addition, many IPAs are high in alcohol sometimes as much as five times higher than average beers. Wheat beer is highly carbonated with a fluffy, creamy fullness and a bubbly white head. It ranges in color from pale straw to dark reddish-gold having a cloudy appearance and yeasty sediment with contributes to its opaqueness. It often carries the aroma of wheat and roasted malt with hints of vanilla and banana. Sweet Stouts are also referred to as cream stouts. They have a mild roasted bitter flavor and a full-bodied mouthfeel. Malt sweetness, chocolate and caramel flavor should dominate the flavor profile of this brew and contribute to its aroma. Hops should balance the sweetness without contributing apparent flavor or aroma. English-style Brown Ales range from deep copper to brown in color. They have a medium body and a dry to sweet maltiness with very little hop flavor or aroma. American-style Amber/Red Ales range from light copper to light brown in color. They are characterized by American-variety hops used to produce high hop bitterness, flavor and medium to high aroma. Amber Ales have medium-high to high maltiness with medium to low caramel character. They should have medium to medium-high body. American-style India Pale Ales have intense hop bitterness, flavor and aroma with medium-high alcohol content. The style is further characterized by fruity, floral and citrus-like American-variety hop character. India Pale Ale possesses medium maltiness and body. American-style Pale Ales range from deep golden to copper in color with a medium body and low to medium maltiness. Brown Porters are mid to dark brown (some may have a red tint) in color. The beer should have a low to medium sweetness along with medium hop bitterness. This is a light to medium bodied beer. Belgium-style Tripels are often characterized by a complex, sometimes-mild spicy character, but no clove-like flavor. Yeast-generated fruity banana esters are also common but not necessary. These pale/light colored ales may finish sweet, though any sweet finish should be light. The beer is characteristically medium bodied with an equalizing hop/malt balance. Alcohol strength and flavor should be perceived as evident. Head retention is dense and mousse like. Belgium-style Fruit Lambics are also known by the names Framboise and Kriek and are characterized by fruit flavors and aromas. The color reflects the choice of fruit. Sourness is an important part of the flavor profile, though sweetness may compromise the intensity. Lagers are the most popular beer in the world. Golden colored, made from bottom fermenting yeast, cold slow fermentation and cold maturation, lagers turn out to be drier, cleaner and mellower in taste than ales. Lagers are well carbonated and can be light to medium in body being aged from one to three months. Pilsners, Dortmunders, Bocks, and Double-Bocks are all made from bottom fermenting yeast and therefore are Lagers. Pilsners, clear, pale to golden-hued with a mild hop aroma and a crisp taste, were the first Lagers ever brewed. A classic Pilsner is medium in body and carbonation with a head almost like soft ice cream above the rim of the glass. Lagers, it’s a bit redundant but it’s both a style and type of beer. While people are familiar with the fact that Pilsners are Lagers, there are many Lagers that are not Pilsners, or Dortmunders or Double-Bocks. All Pilsners are Lagers and all Bocks are Lagers, but not all Lagers are Bocks or Pilsners. Dortmunders full-bodied, moderately hopped brews which are less dry than a Pilsner. Bock is a German term for a strong beer. In Germany it may be golden, tawny or dark brown but outside Germany a Bock is usually dark. Bock beers are best served in autumn, late winter or spring, depending upon the country. South German-style Hefeweizen/Hefeweissbier has the aroma and flavor that is decidedly fruity and phenolic. The phenolic characteristics are often described as clove or nutmeg like and can be smoky or even vanilla like. Banana like esters are often present. These beers are made with at least 50 percent malted wheat and low hop rates. Hop flavor and aroma are absent. Weissbier is well attenuated and very highly carbonated yet its relatively high starting gravity and alcohol content make it a medium to full-bodied beer. The color is very pale to pale amber. Because yeast is present, the beer will have yeast flavor and a characteristically fuller mouth feel and may be appropriately very cloudy. German-style Kolsch is warm fermented and aged at cold temperatures. Kolsch is characterized by a golden to straw color and slightly dry, subtly sweet softness on the palate, yet crisp. Good, dense head retention is desirable. A light fruitiness may be apparent, but is not necessary for this style. Caramel character should not be evident. The body is light to medium-light. This beer has low hop flavor and aroma with medium bitterness. Traditional German-style Bocks are made with all malt and are strong malty medium to full bodied; bottom-fermented beers with moderate hop bitterness that should increase proportionately with the starting gravity. Hop flavor should be low and hop aroma should be very low. Bocks can range in color from deep copper to dark brown. German-style Pilsner’s are very light straw or golden in color and well hopped. Hop bitterness is high. Noble-style hop aroma and flavor are moderate and quite obvious. It is a well-attenuated, medium-bodied beer but a malty residual sweetness can be perceived in aroma and flavor. Its head should be dense and rich. Despite what you may have been told, beer and hard liquor are not the same. The National Beer Wholesalers Association has compiled the following data about the differences between beer and liquor. A standard Scotch on the rocks is equal to 1.5 beers, a Pina Colada has the alcohol content of more than two beers and a Long Island Iced Tea contains as much alcohol as five to six beers. A bottle of beer is a finished product with set alcohol content. Hard liquor is a concentrated product whose alcohol content can vary depending on whether it’s mixed with other beverages, or whether the bartender uses a “jigger” to measure. The bottom line is, when you are served a drink made with hard liquor, it is difficult to know how much you are actually getting – it is probably more than the 1.5 oz. recommended serving size. Most people would agree that it is harder to control the amount of alcohol you consume if you drink hard liquor as opposed to beer or wine and are not fooled by the “a drink is a drink” theory. A recent poll found that more than 50% of adult beverage consumers recognize that a drink is not a drink because liquor is more potent and can be consumed more quickly. Further, nearly 9 in 10 parents and 87% of Americans polled say teaching young people that “a drink is a drink” is a bad idea because liquor is much worse than beer. But regardless of what beverage you choose to consume – do so responsibly and in moderation. Never drive drunk, and remember, if you’re under 21 drinking is against the law. The Beverage Company With A Thirst For Excellence.